NECPWA Club Stores is an establishment for mutual trading between NECPWA Members and does not serve the general public. Lost en route? Telephone on the stores Mobile: 0775 693 8044 - only during Opening Hours. Phone to check stocks before travelling. The Club Stores are please to purchase surplus spares or to accept donations for the stores. NECPWA Club Membership is only £15.00 for UK residents. 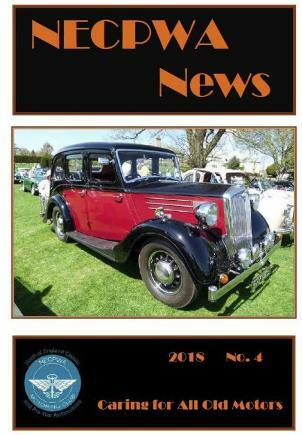 However, to encourage younger people to the Classic Car movement, membership applications from under-30's can be obtained free of subscription, although with a free subscription, members will only receive the 'E' version of NECPWA News. For attendance at some events organised by individual NECPWA Branches, there may be a small additional charge. Acrobat reader 10X or higher or iBooks on a MAC or Apple device is required to open it. Some of our local branches also hold breakfast meetings with optional Road Runs all year around where you can use your Classic if you wish.